The Pay Research Unit (PRU) of the Department of Expenditure, Ministry of Finance brings out an “Annual Report on Pay and Allowances of Central Government Civilian Employees” for each financial year. As in the past, the Annual Report for 2016-17 provides statistical information on expenditure incurred by different Ministries/Departments of the Central Government on Pay and Allowances including Dearness Allowance, House Rent Allowance, Transport Allowance, Overtime Allowance, etc. in respect of its regular employees. The Annual Report also contains information on the group-wise number of sanctioned posts and of employees in position in various Ministries/ Departments. 2. The data in the Annual Report has been compiled on the basis of quarterly returns on expenditure on pay and allowances and annual returns on the strength of Central Government Civilian Employees furnished by the Central Government establishments to the PRU. 3. 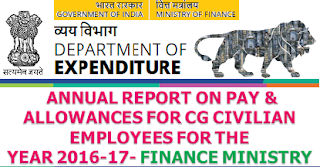 The Annual Report may be of use for personnel planning and for preparation of reliable estimates of financial implications of various proposals concerning pay and allowances of Central Government employees. While all efforts have been made to present the data in a meaningful manner, suggestions for further improvement would be welcome. 4. Ministry of Finance would like to thank all the Central Government Ministries/ Departments/ Organisations for their cooperation in furnishing data, without which this compilation would not have been possible. This Ministry would also like to acknowledge the contribution of the National Informatics Centre (North Block), New Delhi.